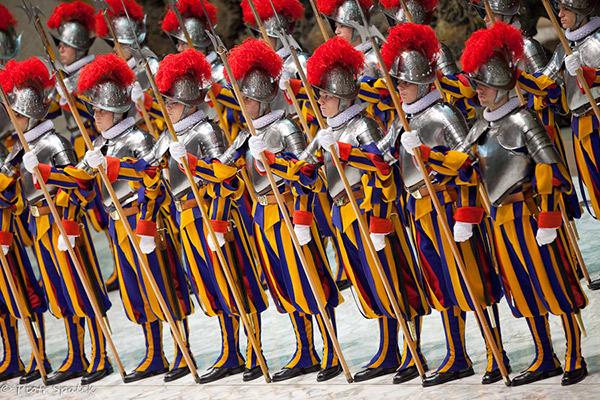 It’s a common belief that Michelangelo designed the uniforms of the Pontifical Swiss Guard. But, in fact, they are based on armor common throughout Renaissance Europe. During the Renaissance, Swiss mercenary soldiers were considered among the best in Europe. When Cardinal Giuliano della Rovere became Pope Julius II in 1503, he asked the Tagsatzung to provide him with a guard. The Tagsatzung — a/k/a the Diet of Switzerland – was the governing body of Switzerland prior to formation of the Swiss federal state in 1848.